Learn to adapt lesson planning to deliberately teach students to think and use technology. In this webinar, Jane E. Pollock, author of Improving Student Learning One Teacher at a Time, is joined by two colleagues as they describe what they call an i5 Teacher. Learn to use GANAGPlus, a lesson planing schema for teachers and co-teachers. Using new research on learning, she explains how every teacher, resource and co-teacher, can teach students to use the nine high yield strategies. This webinar is based on the book, Minding the Achievement Gap One Classroom at a Time. In this webinar, Pollock explains how to give teachers feedback to improve their teaching in order to improve student learning and achievement. 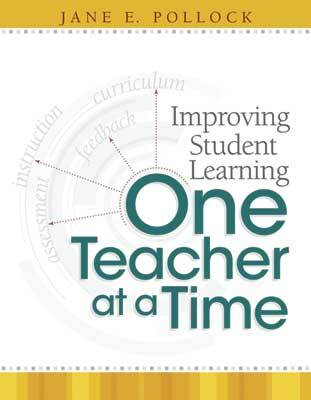 This webinar is based on the book Improving Student Learning One Principal at a Time. Jane E. Pollock, Ph.D., is president of Learning Horizon, Inc.; a former ESL and classroom teacher, school administrator, and districtwide curriculum coordinator; and senior associate at a research laboratory.